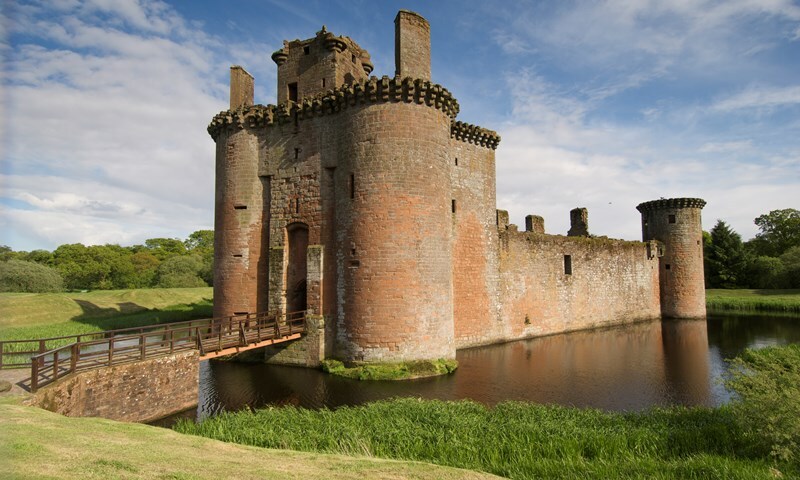 Caerlaverock Castle is distinctive in many ways – for a start it is triangular! It is also distinctive in that it was the site of a siege between the attacking King Edward I of England and the defending Scots in 1300. In the grand scheme of things, this battle would be relatively insignificant but for the fact that the campaign was recorded in a poem in French by a herald, and this text has come down to us. 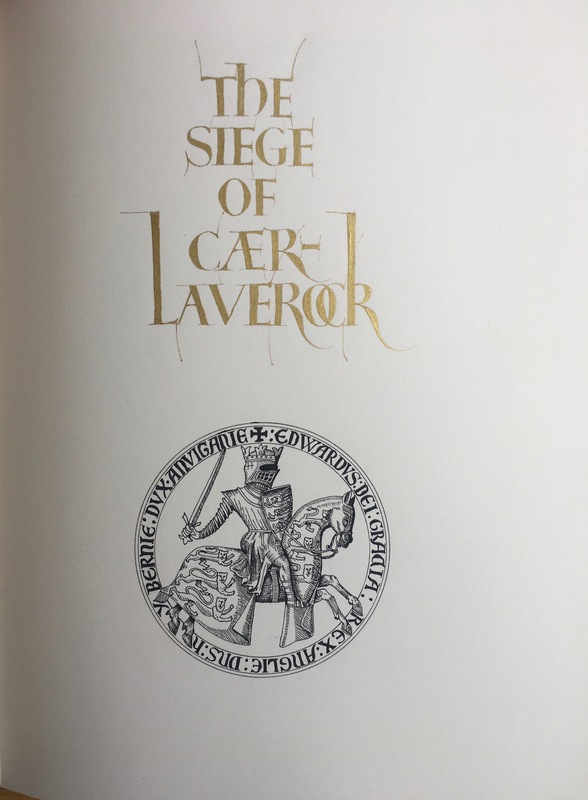 When I was learning the craft, some years ago now, I wrote out this poem in translation and bound it into a book.The first page here shows Edward I’s seal with him depicted as a knight brandishing a sword. 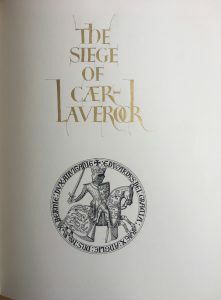 The title lettering is in Lombardic capitals and written and painted in shell gold. 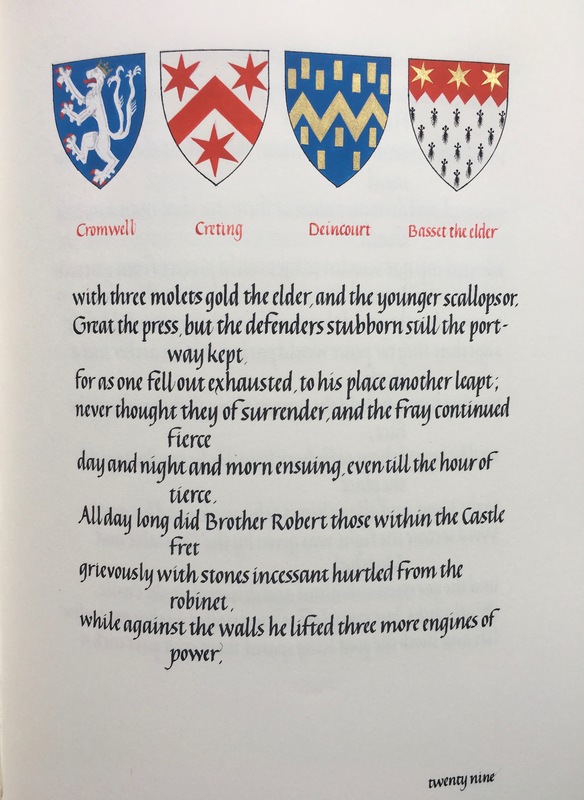 I then wrote out the poem and painted in colour all the coats of arms of the participants according to the blazon (word description) as in the text. 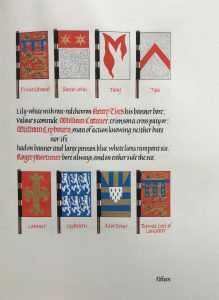 The first line of the verse on the right explains that Henry Tyes’ banner was ‘lily-white with rose-red chevron’, and this is shown at the end of the top row of banners. The background is white with an inverted ‘v’ – the chevron. I was very much into diapering at the time (creating a background pattern) so the white has a grey swirling design. 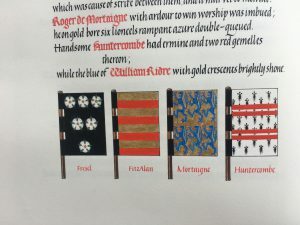 William Lattimer’s banner, though, was ‘crimson a cross paty or’, and this is a red background with a cross with fleur-de-lis ends, and in ‘or’, the Norman-French for gold. I used shell gold throughout the book, which is why it is a bit thin in places (it required a lot of gold!). 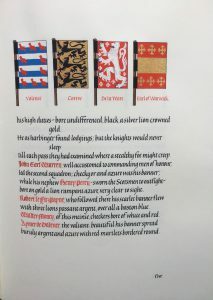 On this page, Earl de Grey’s banner was ‘in pieces six of silver and blue’, well actually the ‘pieces’ are stripes, as can be seen in the second banner from the left along the bottom row. 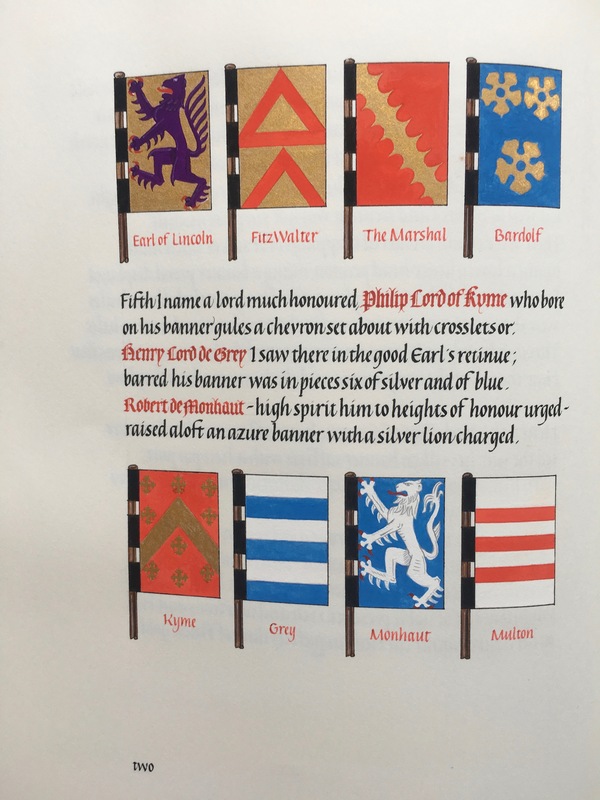 And the banner of Robert de Monhaut ‘high spirit him to heights of honour urged – raised aloft an azure banner with a silver lion charged’ (the English translation of the poem can be a bit contrived!) 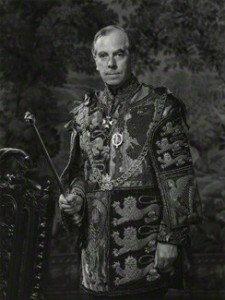 is to the right – blue with a white (silver) lion. 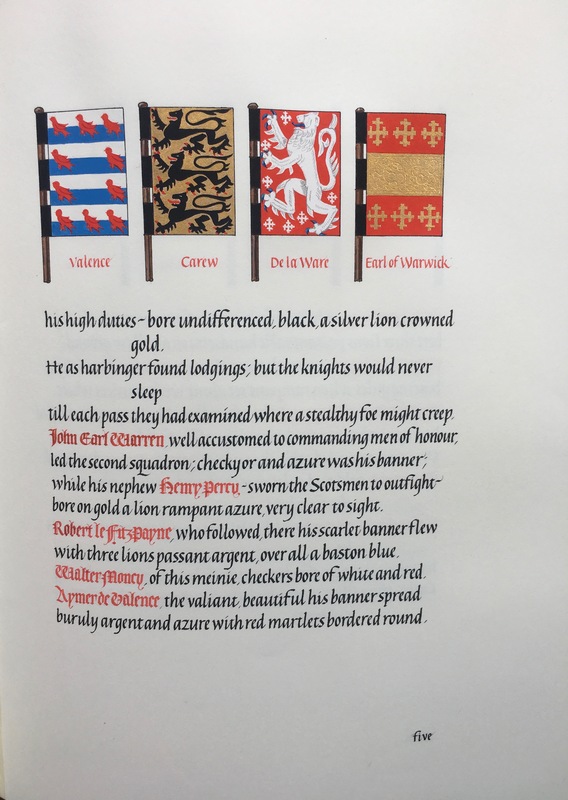 Here is an enlargement of a section of one of the pages, with Roger de Mortaigne’s banner of a gold background and six blue lioncels (little lions) ‘double-queued’, or with two tails. 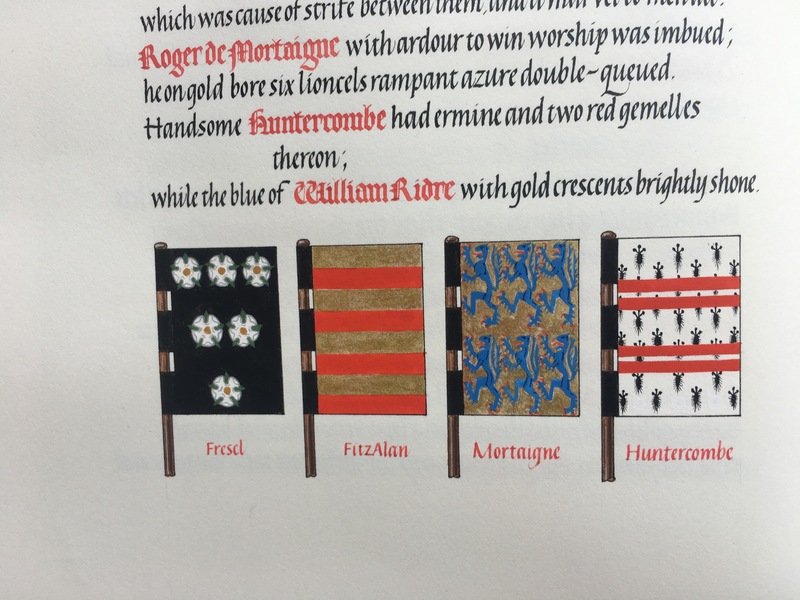 And also ‘Handsome Huntercombe’ had an ermine background to his shield (white with the black ermine tails inserted in slits for decoration) and two red ‘gemelles’ – horizontal double lines. The actual design and layout of the book was a real challenge in that I had somehow to marry up the paintings with the text, and this wasn’t always easy, which is shown here. A whole page giving details of the battle but no shields actually described. The shields are, of course, for those who were below in status to those who could bear banners. And the humble foot soldiers, who no doubt did most of the fighting, were not recorded in any way! The lettering is in Chinese liquid ink, which is a dense black, and the writing style a sort of upright Italic. I wrote the names below the shields and banners in vermilion Chinese stick ink, which I ground on a slate inkstone and mixed with water. The actual names in the text were written with the same ink but in Gothic Black Letter which made them stand out (perhaps a bit too much, but I was learning!). As my course also included book binding, I bound the book myself in black leather, and gold stamped the title on the spine. The castle can be visited by the public now and although it is in ruins it is possible to see how much of a challenge this must have been to the English, although the Scots, despite their seemingly impregnable castle, were defeated. There’s more about the poem here. This entry was posted in Blog, Books, Calligraphy and lettering, Craft, Historical building and buildings, Interesting stuff, Manuscripts and tagged 1300, Caerlaverock, Caerlaverock Castle, Edward 1, heraldry, Siege of Caerlaverock on 17 June 2017 by Patricia. 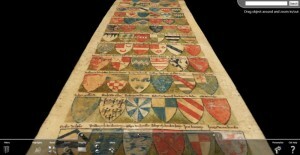 The Dering Roll is the oldest roll of English coats of arms and dates from 1270–1280. 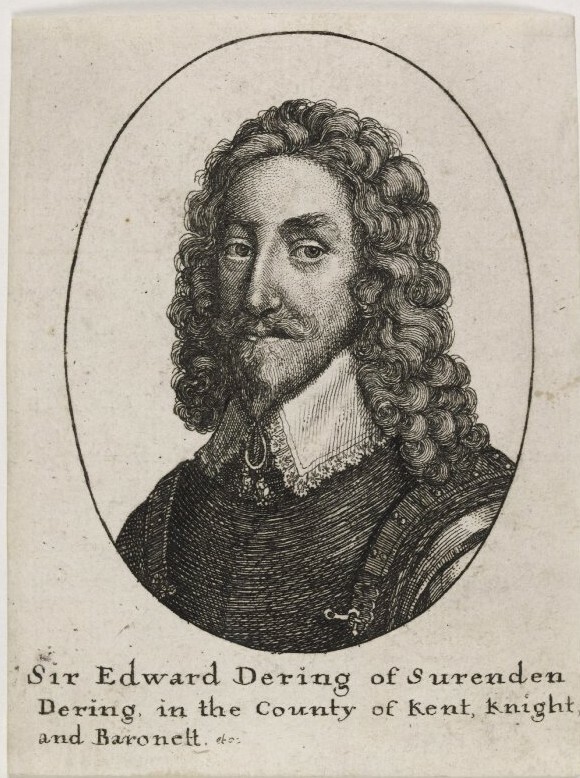 In the seventeenth century it was acquired by Sir Edward Dering (1598–1644) (right), from Dering in Kent, who is described as a knight and a baronet. He bought it in the seventeenth century, and although it seems dreadful to us now, he ‘modified’ the roll to include a fictitious ancestor of his own. While Dering was lieutenant of Dover Castle, he removed entry number 61 on the roll, the coat of arms of Nicholas de Croill, and put in his own arms with the false name of Richard fitz Dering in its place. This was to prove the ancestry of his family. It is thought that the roll was commissioned by the Constable of Kent, Stephen of Penchester, which would explain why there are more coats of arms from Kent and Surrey than from elsewhere. 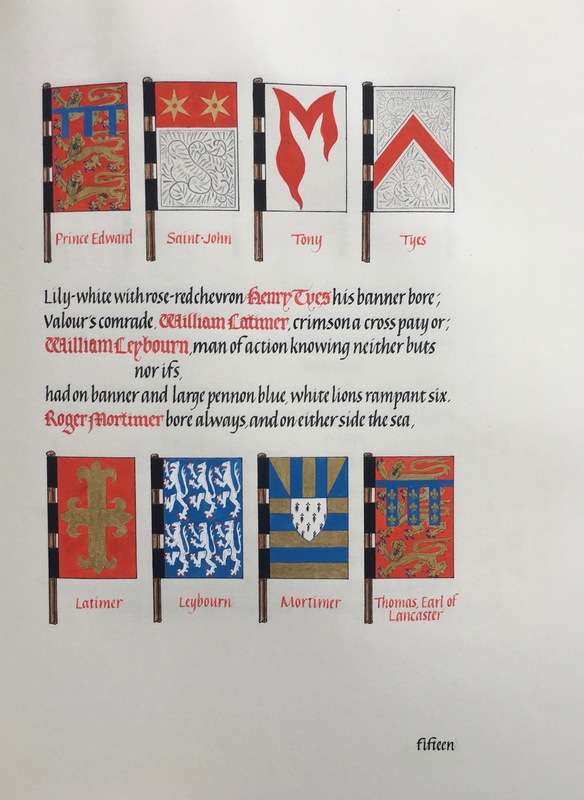 The roll itself starts with the two illegitimate children of King John (1166–1216, king from 1199 to 1216) who were Richard Fitz Roy (fitz = son, roy = king) and William de Say, although their coats of arms at the top are difficult to discern because of the condition of the roll. Made from four strips of 8 inch wide parchment pasted together, and stretching to almost three yards in length, it is a huge piece of work, and it’s remarkable that it has survived so well. The shields are arranged six to a row and there are 54 rows, making 324 shields in all. 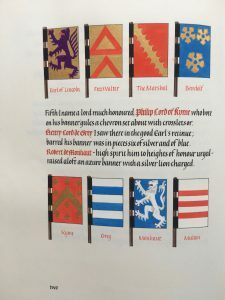 All but five of them have the individual names of the knights written above them. These names have either been removed or were never written in in the first place. The background to the colourful shields is painted green. In the twentieth century it was bought by Sir Anthony Wagner (right) who became Garter King of Arms at the College of Arms in London. It was sold at Sotheby’s in 2007 for £192,000 and was due to be exported from the country. A stay of execution meant that the British Library were able to raise the sum of £194,184 to ensure that it stayed in the country. The importance of this heraldic roll is summed up by the Head of Mediæval and Earlier Manuscripts, Claire Breay, who said of the purchase, ‘the acquisition of the Dering Roll provides an extremely rare chance to add a manuscript of enormous local and national significance’. This entry was posted in Blog, Calligraphy and lettering, Manuscripts and tagged British Library, Dering Roll, heraldry, King John, Sir Anthony Wagner, Sir Edward Dering, Stephen of Penchester on 16 January 2014 by Patricia. 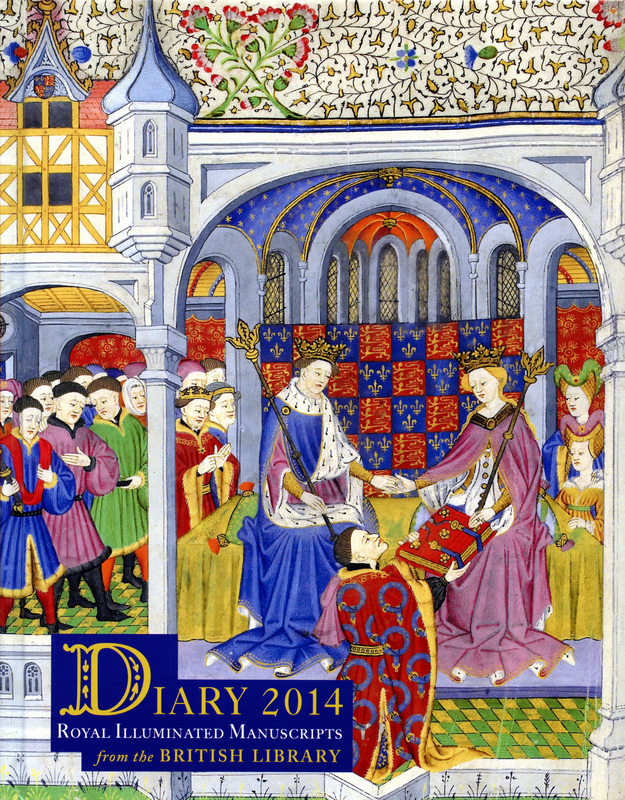 The British Library Diary for 2014 is exquisite! Page after page of fantastic manuscripts, in rich jewel-like colours, greet each week. The images are taken from the collection of Royal Manuscripts given to the nation by George II in 1757, but with additional miniatures from selected other collections too. 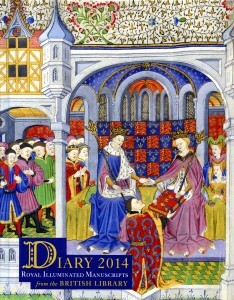 The cover (right) shows the Earl of Shrewsbury, with his sumptuous red velvet and fur-lined robe, decorated with circular blue and gold Orders of the Garter, presenting his book to Margaret of Anjou. It doesn’t look a very happy court, though; no-one is looking in the least bit pleased, and most seem to be actually sneering! 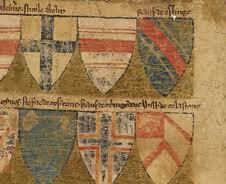 The backcloth of blue and red squares shows the arms of England at the time. The claim to lands in France meant that the gold fleur-de-lis on a blue background took precedent in heraldry to the gold leopards of England on a red background. The very sharp printing means that it is possible to see all the details. In this miniature from the Bedford Hours (c.1410–30), Clovis, who became the first king to unite France in 481 when he was 15 years of age, is being helped on with his armour. At the same time his queen, Clothilde, is handing him his shield showing the arms of France. Note the cute little dog looking on admiringly, and the rather pathetic stone lions guarding the entrance. 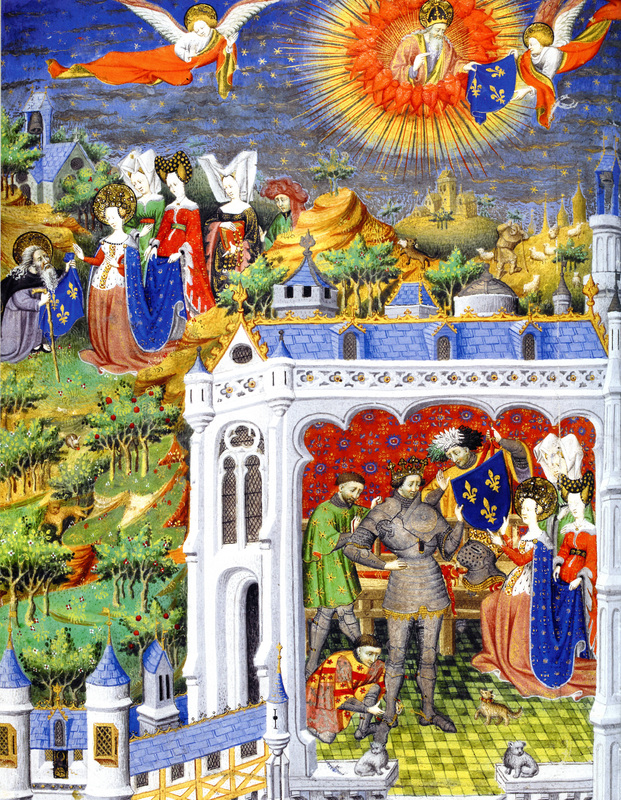 In the upper part of the miniature, God is giving a cloth painted with the French arms to an angel, indicating that Clovis was a Christian and so blessed. In the countryside around there is a rather fierce lion, a rabbit munching a very red apple, and a wolf making off with a sheep, and the shepherd shaking his fists as a consequence. 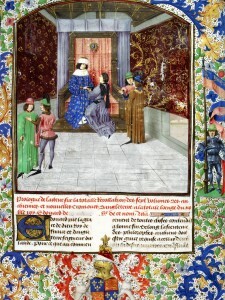 Another book being presented is depicted in this miniature of c.1475. 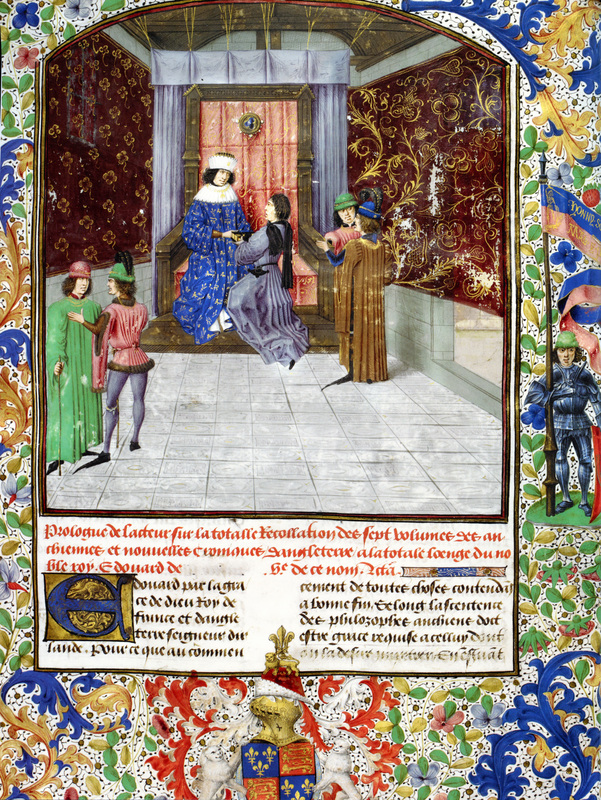 Here the author Jean de Wavrin is painted on his knees in front of Edward IV. The king’s robes again show the gold fleur-de-lis on a blue background, and they contrast with the rather dull grey of the writer’s clothes. Edward’s throne is quite magnificent with a wonderful red back cloth and an interesting trefoil decoration attached quite high up. Two hats are quite fun, and must have looked rather strange when viewed from the front, as the large black plumes on the blue (right) and green (left) hats look as it they would have stuck up rather like coxcombs! The burgundy wallpaper does look particularly fine. 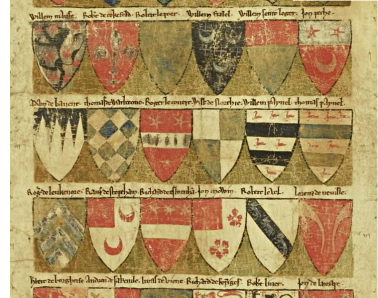 Note the arms of England sliding off the bottom of the page, with France in the first and third quarters, which are always regarded as the most important in heraldry, and England in the second and third – less important. 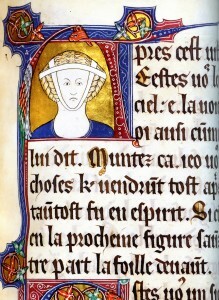 This miniature from the Wells Apocalypse (early 14th century) shows the writing very clearly, and the prescissus, or cut off, endings to the letters are really distinctive. Note the tops of the ascenders of the letters l in the third line, and the bottoms to the letters i, u, s (looks a bit like an f) and i in the fourth line. Some think that these shapes were made by simply turning the pen to its full width horizontally, but the letters l suggest a different method. Note the little tail at the top on the right hand side, particularly with the second l (line 3). This small tail indicates that the letter was started from the right and then the pen was moved down to the left to make the downstroke. The tail wafting in from the left and the thickening of the stroke at the top was then added on afterwards. Similarly, the bottom of the strokes are made by maintaining the pen nib at an angle of about 30° which results in a slanting end to the letter, and then ‘filling’ in the rest of the stroke to make it look cut off at the end. 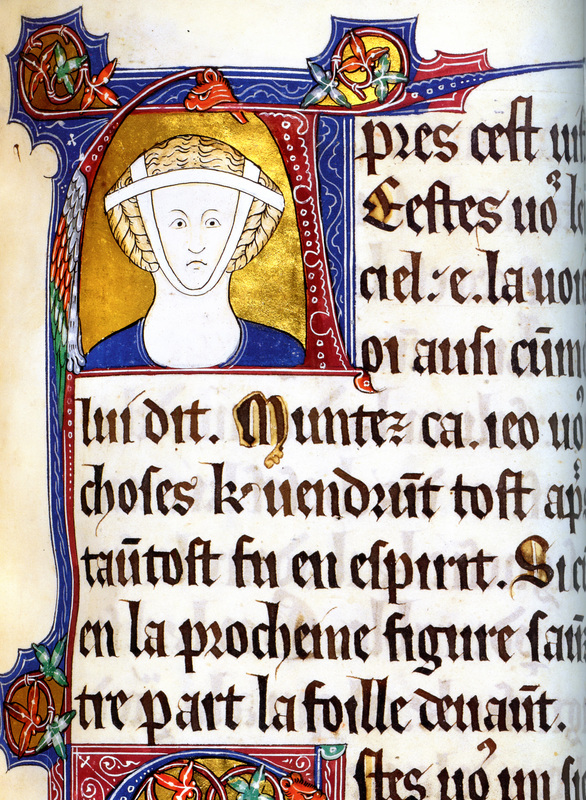 Sadly the woman shown in the initial A doesn’t look too impressed by it all, despite her very elaborate headdress! This entry was posted in Blog, Manuscripts and tagged British Library, England, France, heraldry, miniature on 5 November 2013 by Patricia.